Editors note – continuing is our series on breaking down the winners each week on DraftKings and FanDuel by contributor James Gagnon. James breaks down the winning line-ups each week in the million dollar contests held every Sunday this NFL season. 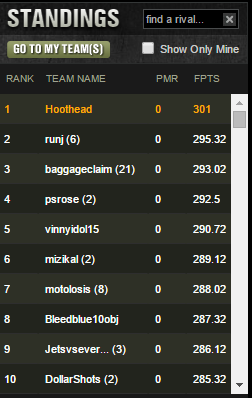 Hoothead scored a killer 301 points to win DraftKings’ tourney; the 2nd highest score ever in any of their Millionaire Makers. cookies248 won with a score of 252.10(oddly enough, the 248 in the moniker still would’ve won), when the Week 1 winning score in the same tournament was a paltry 201.32. Take your shot this Sunday at FanDuel – use promo code FREAK at lock in a 100% deposit bonus! “Winter is coming,” and the offenses are awakening. While that’s no fun, and DFS is different than what he was talking about then, the basis behind the advice still lies true. We don’t know anything until we see it. Pre-season gives us a little peek. Hard Knocks takes us as far as an NFL team will allow us into their world. There is endless analysis by “experts.” Yet, we don’t know anything for sure heading into a season until it happens in front of our eyes. Proof of this is Larry Fitzgerald. In week 2, Fitz was owned by less than 6.5% on both major sites. 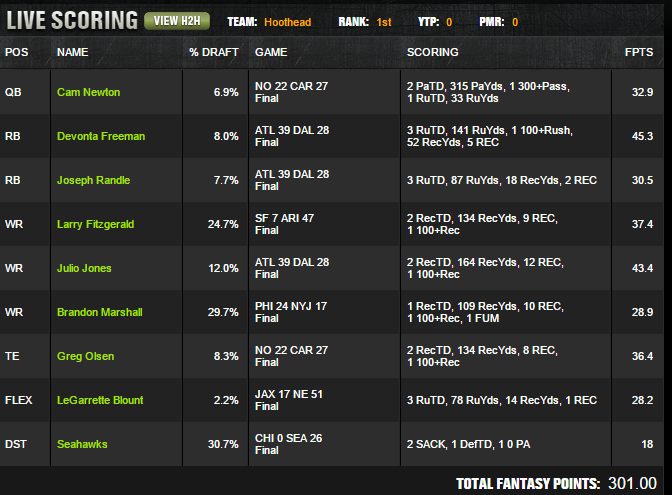 In week 3, that number jumped to 24.7% in DK and 22.5% in FD. And he was owned on 9 of the top-20 teams and rewarded those owners with 9 receptions for 134 yards and 2 TD. Going into the season, John Brown was being drafted ahead of Fitzgerald in a ton of leagues… he was the next big thing. And he still could be. But what’s in front of us right now, is Fitz nearly doubling his receptions(23 to 12) and yardage(333 to 153), while outscoring him with 5 TD’s to 1 for Brown. Now is the time where the analysis of the most recent past can help us going forward the most so pay attention more than ever. Seattle wasn’t a cheap Defense, so don’t be afraid to pay for D when the matchup presents itself. The same goes for the Kicker position in FanDuel; fractions of points can mean the difference between $1 million and $350,000. AJ Green’s hands might not be that bad after all. And, maybe Andy Dalton does have a little skill, huh? Find a way to pay for Julio every week. His ownership will be up, but he won’t let you down, I promise. Greg Olsen is easily the top target in Carolina, and Cam’s legs and their Defense(with the newly acquired Jared Allen), will only give him more opportunities. Roethlisberger is a huge blow to many of you in the yearly fantasy world, I’m sure. He’s always had the tools, he was just never let off the leash, so to speak. Antonio Brown might lose a few points with Michael Vick at the helm, but I advise the same as I did with Julio Jones; he’ll be thrown to plenty with the porous Steelers defense. As far as Lynch and McCoy go, we’re back to NFL lies again. Pete Carroll says there’s “nothing to be alarmed about,” concerning Marshawn Lynch. With all due respect, I don’t believe either of the head coaches. Victor Cruz says he’s 100% and ready to go. Keep a close eye on Jay Cutler and Drew Brees and read between the lines. Both QB’s are playing for teams with a bad start out of the gate, who are clearly looking toward the future. We’re already seeing a dump of salaries by the Bears, and while QB’s being traded mid-season doesn’t happen very often, I believe one of these players will be shipped to a new team soon. 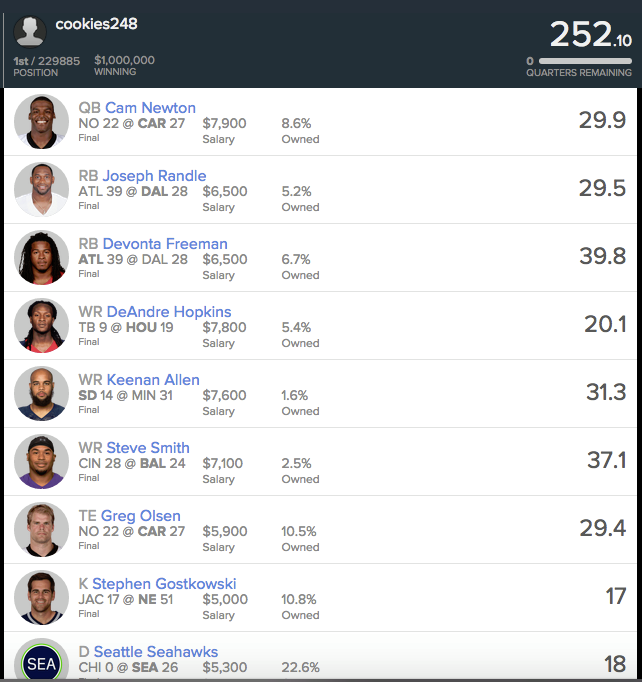 Fanduel or DraftKings for Football?